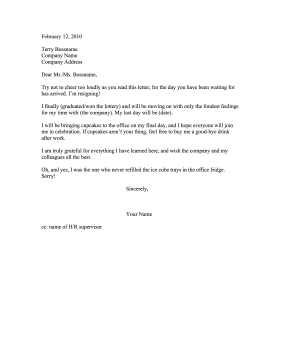 This funny resignation letter puts a happy, positive spin on an employee's time spent at an office, as well as their ultimate departure. Try not to cheer too loudly as you read this letter, for the day you have been waiting for has arrived. I'm resigning! I finally (graduated/won the lottery) and will be moving on with only the fondest feelings for my time with (the company). My last day will be (date). I will be bringing cupcakes to the office on my final day, and I hope everyone will join me in celebration. If cupcakes aren't your thing, feel free to buy me a good-bye drink after work. I am truly grateful for everything I have learned here, and wish the company and my colleagues all the best. Oh, and yes, I was the one who never refilled the ice cube trays in the office fridge. Sorry!